Serve as a fresh starter or a light main course. If you can’t find sushi grade salmon (or don’t like raw fish ceviche), then please use smoked salmon. 2. Slice the salmon thinly and add the marinade. Set aside for 30-60 minutes. 3. Combine all ingredients for the avocado puree. Cover with plastic and chill in the fridge. 4. Steam or grill (in the oven) the red peppers until softened. Remove the skins. Add the sweetener and mix into a puree. 5. Do the same for the yellow peppers. 6. Dice the peppers for decoration. 7. On a plate, spoon the red and the yellow purees next to each other, sprinkle the diced peppers on the opposite color. 8. 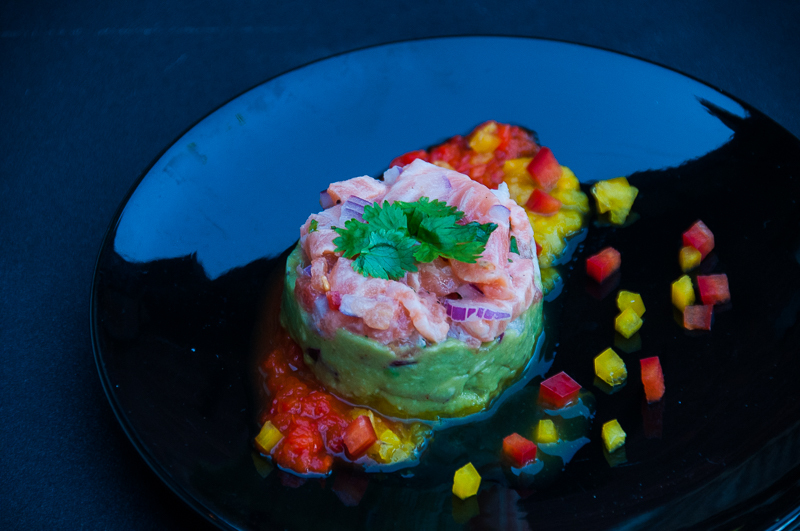 Using a ring mold, first spoon the avocado puree on the bottom, then add a thick layer of salmon. This entry was posted in Main Course Fish, Menu, Starter and tagged ceviche, guacamole, pepper, puree by EvaH. Bookmark the permalink.